Search.searchlwp.com is the PUP that uses misleading techniques to prevent removal. Use Reimage to locate malicious components and get rid of them faster than with uninstall instructions. A full system scan blocks virus reappearance and prevents traffic to malicious domains. Search.searchlwp.com is a suspicious search engine created by Polarity Technologies Ltd. Just like many other company’s creations, this one is also categorized as a browser hijacker. After the infiltration, it might change browser’s settings, display commercial content, and monitor your browsing activities. Spreads with Local Weather Pro application that is usually added to software packages. After the hijack, affected browser’s homepage, search engine or new tab might be changed with Search.searchlwp.com. New browser’s startup page might look useful and convenient. 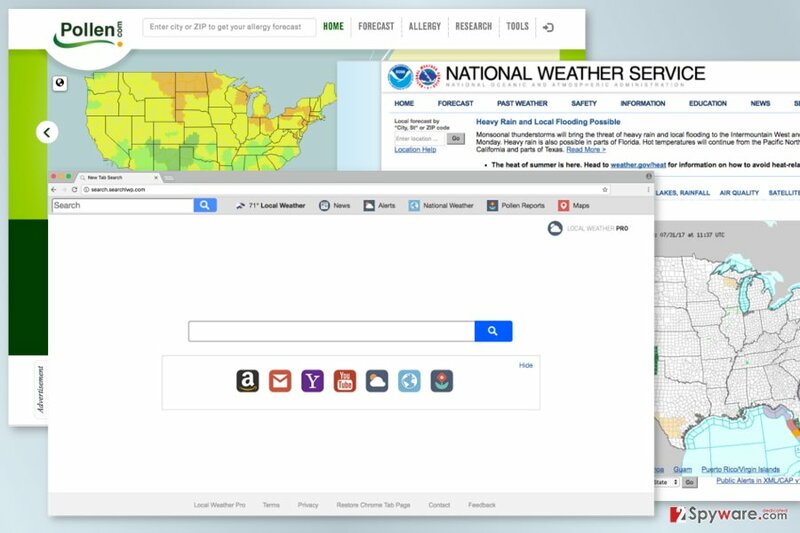 It allows quickly accessing weather forecast, Gmail, Yahoo, Youtube, and Amazon. However, you should not be tricked by its appearance. The hijacker might make browsing the web unbearable. Currently, Search.searchlwp.com virus redirects searches to Yahoo. Therefore, it should not alter search results. However, it’s possible that the situation might change soon and the hijacker might become capable of including sponsored links in the search results page. After the Search.searchlwp.com hijack, you might also notice that your computer became sluggish and browser frequently crashes. Browsing problems might occur due to the excessive amount of online ads that might be delivered on each website you visit. The hijacker generates pay-per-click revenue, so ads might annoy you a lot. However, even bigger problems might occur after clicking such pop-ups or banners. They might lead to suspicious, misleading or potentially dangerous websites. These sites might offer to download bogus software, give an amazing discount in exchange for your private information or infect your PC with malware. Thus, these Search.searchlwp.com redirect tendencies should motivate you to get rid of the hijacker ASAP. If you value your privacy and do not want to be spied on by unknown people, you should remove Search.searchlwp.com as soon as it appears on Internet Explorer, Google Chrome, Mozilla Firefox or another web browser. The best way to do it – run the system scan with Reimage or another anti-malware. Additionally, you can opt for the manual Search.searchlwp.com removal. If you are willing to locate and delete hijacker-related entries on your own, we suggest checking the instructions at the end of this article. Search.searchlwp.com virus is a nasty browser hijacker that takes over the browsers and monitors browsing activities. reject installation of additional programs by unmarking ticks near them. This cyber parasite mostly spreads in the United States; however, users from other regions, such as Scandinavia, Russia or Asia, should be aware of this sneaky distribution method in order to avoid other PUPs. There are two Search.searchlwp.com removal options – manual and automatic. Manual elimination option is more difficult than automatic. Thus, it’s recommended for skilled and determined computer users. At the end of the article, you can find illustrated instructions that will guide you through this procedure. Meanwhile, any skills needed to remove Search.searchlwp.com automatically. All you have to do is to obtain reputable security software and run a full system scan with the help of it. Check recently installed program via Control Panel. There you might find unknown entries related to Search.searchlwp.com browser hijacker. Uninstall them. Here, look for Search.searchlwp.com or any other recently installed suspicious programs. The hijacker might affect Mac OS X. Thus, if you find unknown homepage after launching the browser, you should look up for suspicious applications and remove them. Wait until you see Applications folder and look for Search.searchlwp.com or any other suspicious programs on it. Now right click on every of such entries and select Move to Trash. When in the new window, check Delete personal settings and select Reset again to complete Search.searchlwp.com removal. These instructions will help you to get rid of the browser hijacker from Microsoft Edge. Once these steps are finished, Search.searchlwp.com should be removed from your Microsoft Edge browser. First of all, you have to uninstall suspicious Firefox extensions. Then reset it. Here, select Search.searchlwp.com and other questionable plugins. Click Remove to delete these entries. Now you will see Reset Firefox to its default state message with Reset Firefox button. Click this button for several times and complete Search.searchlwp.com removal. If Search.searchlwp.com virus affected Chrome, you should uninstall unknown browser extensions and the rest the browser. Here, select Search.searchlwp.com and other malicious plugins and select trash icon to delete these entries. Click Reset to confirm this action and complete Search.searchlwp.com removal. Here, select Extensions and look for Search.searchlwp.com or other suspicious entries. Click on the Uninstall button to get rid each of them. Here, look at the Homepage field. If it was altered by Search.searchlwp.com, remove unwanted link and enter the one that you want to use for your searches. Remember to include the "http://" before typing in the address of the page. Now you will see a detailed dialog window filled with reset options. All of those options are usually checked, but you can specify which of them you want to reset. Click the Reset button to complete Search.searchlwp.com removal process. ^ Paul Cucu. Browser hijacker: Definition, Removal and Prevention Guide. Heimdal Security Blog. The blog about cyber security. ^ Personally Identifiable Information (PII). Safe Computing. The University of Michigan. ^ Bedynet. Bedynet. Russian website about computer viruses and their removal. This entry was posted on 2017-07-31 at 06:57 and is filed under Stealing programs, Viruses. You can quickly scan the QR code with your mobile device and have Search.searchlwp.com virus manual removal instructions right in your pocket. How did you remove Search.searchlwp.com virus?